Wine bottle tags do away with hide & seek. Find the exact wine and year you're looking for at a glance, while other wines slumber on undisturbed. Whether you have 50 or 5,000 wine bottles, our wine bottle tags are the best way to organize your wine collection. Organize your wines for easy access. Wine bottle tags do away with hide & seek. Find the exact wine and year you're looking for at a glance, while other wines slumber on undisturbed. Whether you have 50 or 5,000 wine bottles, our wine bottle tags are the best way to organize your wine collection. Accepts grease marker only. 100 reusable plastic wine bottle tags. Any dry erase marker will work with this product. Then just use a damp cloth to remove the writing. What are the Tag Dimensions? And does it have WineEnthusiast printed at the top on both sides? Do the Oversized reusable tags have WineEnthusiast printed on both sides? BEST ANSWER: Hello and thank you for your question. These bottle tags are 2-1/8" wide and 3-1/4" in height. Both these tags and the oversized reusable version only have our logo printed on one side. The tags I ordered are 3 1/4" x 2 1/8", and the Wine Enthusiast logo is only on one side. Can we get custom logos printed on these? BEST ANSWER: Thank you for the conquest, unfortunately we they do not offer personalization on the bottle tags. I had a local printer make me custom wine tags as a gift for a collector friend. Do the plastic wine bottle tags fit over a larger neck or flanged bottle without cutting or stretching? BEST ANSWER: Thank you for your inquiry. Without stretching, the bottle tags will not fit some of the larger bottles. If you have any further questions, feel free to contact us directly at 800 356 8466. Thank you again. No, the tags won't fit without stretching. These tags are inexpensive but for a reason. They are much flimsier than tags I purchased from WE some years ago. And they don't stay flat. 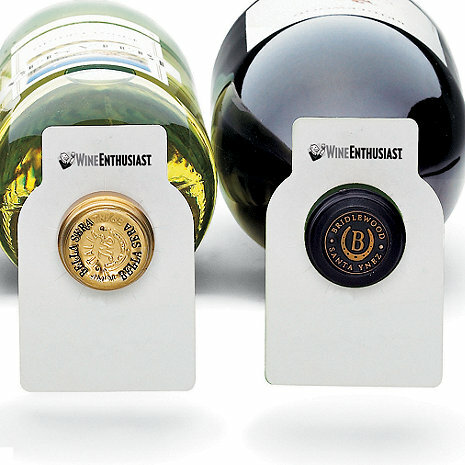 These wine tags are durable and reusable. You must use a grease pencil (also known as a 'china marker') to write on them. Although you cannot write on them with a graphite pencil, a regular pencil eraser actually turns out to be the best thing for cleaning them. The tags are made of durable plastic, so each one should last a long time. They fit a bit snugly over flange-top bottles, but the plastic will stretch to accommodate these bottles. If your wine rack angles the bottle necks slightly downward then you may have occasional problems with the labels slipping off, but it's not a serious problem. Overall, its a good product. These bottle tags are very light-weight and not as sturdy as the tags I previously purchased. They are reusable which is great, but the marker is not included. Product is made well & like the erasable feature. Shipping high for this product. I wish I had found the personalized tabs first. I tried these instead of the paper version. I have been pleased so far. Fine point dry erase marker works fine. The picture above is what I have ordered in the past. What showed up is a different looking tag. It is much wider and has serrations around the bottle neck hole. This tag does not look as sharp as the tag in the picture above. Shame. They should update their website photo to reflect what they are actuall selling. The splits around the neck causes the tags not to hang straight. The paper seems too thin. I recent purchased a Euro Cave wine cellar and have over 250 bottles of wine. I was hoping to utilize this product for organizational purchases. I am still trying to locate the proper writing utensil that will not smudge! Would have appreciated a bit more substance to these tags. The pictures show a flat item. What comes is what appears to be a very thin, flimsy, warped teflon tag, that is not as attractive as advertised. Looks like a piece of paper stuck on the bottle. I have not been able to find a pen that works on the tag except for a wet-erase marker. Tags are durable but writing with white board markers leaves traces of ink even after using white board cleaner. OK for home use. These tags are good in theory: reusable and simple. Unfortunately, writing on these tags with a grease pencil proves to be more of a nuisance. Removing the writing is equally frustrating as you have to rub quite hard to take everyting off, causing the tags to bend and crease. I started using a permanent Sharpie on these just so they looked nice, thereby losing the reusable aspect. No instruction or recommendation of what type of writing instrument to use. Not enough room to write wine name, winery name, vineyard location, vintage, and rating. Hopefully they bring back the personalized tags. Reusable tags are a great help in organizing my 500+ bottle collection. All my wine is tagged and these reusable tags are great. They are easy to erase and write on repeatedly. the tags work well, with flexibility to use on various size bottle necks. And having reusable tags is great - the information easily washes off. Just used these for my new wine cellar. Vast improvement over my old pieces of cardboard method. Plan to buy more. Extremely practical. We put the month & year of purchase. The vintage & kind of wine. We can see at a glance what we have...no longer have to keep pulling bottles out of the rack to find what we want. We use these labels to mark the price, where to buy, and our own rating note. We then use the label as a reminder to buy more of the wines we like to keep on hand. I will use these myself and gave some as gifts! These tags are an immediate way to see the data of the year, chateau and rank of your racked wine without having to revolve or pick up the bottle. You determine the order and ranking of information so you can access the data you require to choose a wine. Need to ID your wine bottles? Great to ID bottles of wine without having to open the wine cooler. Nice quality, and easy to use. Nice quality and will be able to use them over again. These labels are the perfect accompaniment to my wine cabinet. I can now quickly find any wine without having to open my wine computer program. The tags are very easy to clean and use. I highly recommend this product to anyone with a wine collection. We use in our wine cellar. Along with being reusable, I really like the way the hole is feathered so that the tag fits on different sized bottle necks. I've torn many a tag trying to get them on thicker bottle necks. This is an easy way to find the wine that I'm looking for. Our wine is stored in a dim corner of the basement, so it's difficult to see which wine is which. We designed our own removable stickers (which we apply to the tags), so we can reuse the tags. This is a great product for home vintners. We will use this daily to organize our wine collection. No more wondering the cost of a bottle of wine or what's in the bottle! These wine tags have a greast design (hard to believe-but true. The opening adjusted to bottle size and fits snugly without ripping the label. The tags stay on the bottle when the cellar door shuts (my pet peeve). It's an easy way to read what wine is stored. And the tags are reuseable. Helpful in identification of wine bottles. I color coded my wine varieties with the color of marker I use on these wine bottle tags so I no longer have to pull bottles out of the rack to see what they are. And they really are reusable! Now I can find what I'm looking for much faster and easier. Love these! The tags are a nice size and easy to write on. I have not found them to be reusable however. Haven't found a writing instrument that comes off and doesn't leave grooves. Still, I find them handy to easily locate wines in my storage racks. When I got the tags, I thought they seemed rather flimsy but, in using them, the flexibility works well and they are surpisingly durable. I haven't broken one yet. One of the best things about them though is you can use them easily with Avery 6461 removable labels. I custom made my own wine labels, which stick to the tags very well and yet are very easy to remove so the tag can be reused. There are two things I don't like about them: 1) the hole isn't large enough for the largest bottlenecks (so far, I've been able to get them on these but not without a good bit of effort); and 2) the holes are too large for slimmer bottlenecks (they barely stay on...too much wind or movement around them and they can fall off). Suggestion: this product could be improved by having a hole similar to Product # 571 02 01 (100 Ultra Wine Bottle Tags Paper). I wouldn't change anything else about the design.